“Rudolph the Red-Nosed Reindeer” is the favorite holiday film among all adults, with a net favorability of 77 points. 59% of those ages 18-29 link “The Nightmare Before Christmas” to holiday tradition — 19 points above the average. 65% of adults are likely to watch a holiday movie on a streaming service; 72% said they’d watch a holiday special on live TV. Watching classic holiday movies such as “Rudolph the Red-Nosed Reindeer” and “Frosty the Snowman” around this time of year is a tradition for many people — in fact, “Rudolph” was the most-loved holiday film among all adults in a recent Morning Consult/The Hollywood Reporter survey, with a net favorability of 77 points. “Rudolph,” a 1964 television special that has aired every holiday season since its premiere, was also the film most closely linked with tradition among the general population, with 68 percent of respondents saying that the animated classic is associated with their holiday traditions. 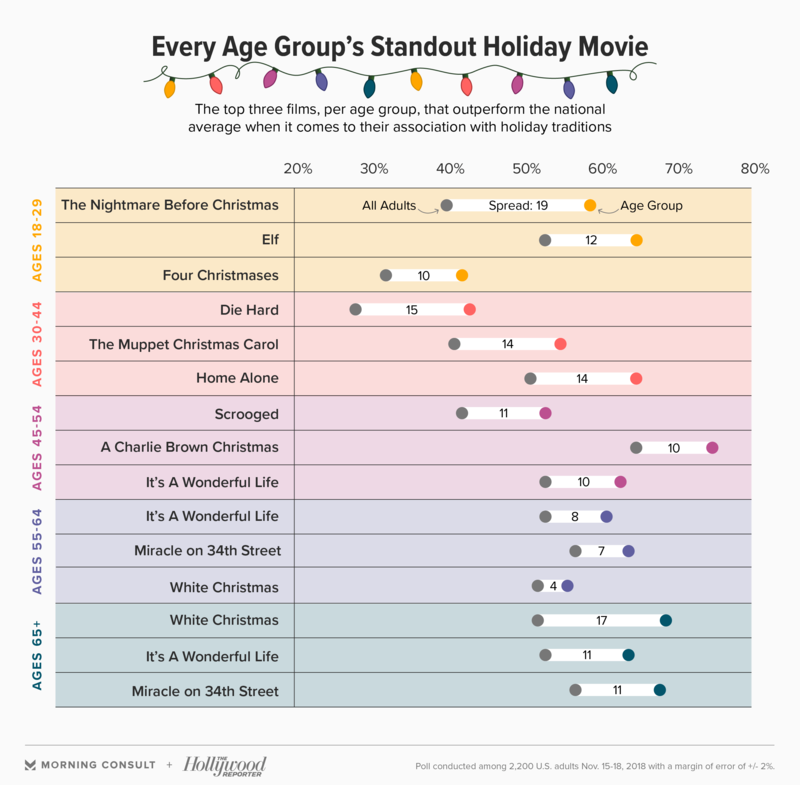 But a closer look at the different age groups in the Nov. 15-18 poll of 2,200 adults shows that some movies outperform the national average when it comes to their association with holiday traditions. Take, for example, “The Nightmare Before Christmas,” which 59 percent of adults ages 18-29 said they associate with holiday tradition — 19 percentage points more than the general population. And while a majority (51 percent) of those ages 30-44 don’t consider “Die Hard” to be a Christmas movie, 43 percent of respondents in that age group associate the film with holiday traditions — up 15 points from adults in general. Adults over the age of 54 were more likely than the general public to associate tradition with films like 1946’s “It’s A Wonderful Life,” 1947’s “Miracle on 34th Street” and 1954’s “White Christmas.” Among those ages 65 and older, 69 percent said the same about “White Christmas,” up 17 points from U.S. adults overall. Viewers in the Morning Consult/The Hollywood Reporter survey said the top factor in influencing them to watch a holiday film is whether or not they like the cast (69 percent), followed by the film’s status as a classic (65 percent), whether or not they had heard family or friends talk about it (62 percent), and if the film made them feel nostalgic (60 percent). As for how they will see movies during the holiday season, 65 percent of consumers said they’re likely to watch a holiday movie on a streaming service, and 72 percent said they are likely to watch a holiday special on live television. While the films most associated with tradition among the general population — “Rudolph the Red-Nosed Reindeer,” “A Charlie Brown Christmas,” “Frosty the Snowman,” “How the Grinch Stole Christmas” (animated) and “A Christmas Story” — are not available for free on popular streaming platforms, they typically air on television during the holiday season. But even though classics like “Rudolph” are absent from platforms like Netflix Inc., the streaming giant isn’t avoiding the holidays. In competition with networks like Hallmark Channel and Lifetime, Netflix has launched a holiday campaign called “It’s Beginning to Look A Lot Like Netflix” featuring original holiday films and holiday-themed episodes of television programs. Though consumers were more likely to watch a holiday movie on streaming or on TV, they’re unlikely to avoid the cinema altogether: December has historically been a big month for the box office, with blockbuster franchises such as “Star Wars” and “The Lord of the Rings,” as well as major James Cameron hits “Titanic” and “Avatar” premiering during the month. For instance, 2015’s “Star Wars: The Force Awakens” brought in more than $936 million domestically from its Dec. 18 release date to when it closed in June 2016, making nearly $248 million its opening weekend alone, according to Box Office Mojo. This holiday season, 45 percent of consumers said it was likely they would see DC’s “Aquaman” in theaters. The survey, taken before the Nov. 21 premieres of “Robin Hood” and “Creed II,” shows 44 percent and 41 percent of U.S. adults respectively said they were likely to see those films. As of Dec. 2, “Robin Hood” has grossed only $21.8 million domestically, according to Box Office Mojo, and “Creed II” has generated nearly $81 million in the same market.